The Archbishop of Canterbury, the Most Revd Justin Welby, reflects on the birth of Jesus in a service for Christmas morning from the Chapel of Lambeth Palace. 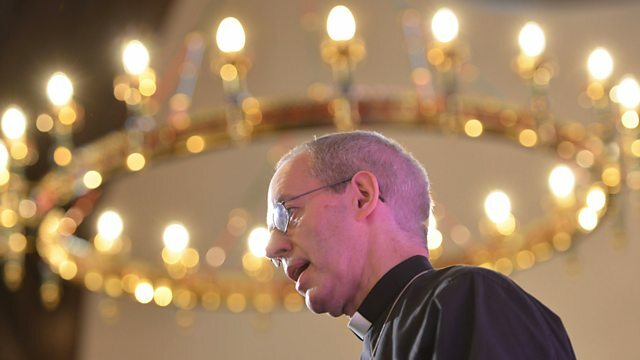 The Archbishop of Canterbury, the Most Revd Justin Welby, reflects on the birth of Jesus in a service for Christmas morning from the Chapel of Lambeth Palace, with members of the Community of St Anselm. It features traditional readings and carols, including Joy to the World and Hark! The Herald Angels Sing. Music is provided by St Martin’s Voices and Brandenburg Sinfonia, directed by Richard Tanner. The producer is Andrew Earis. Good morning and a very Merry Christmas! Welcome to Lambeth Palace, where we are getting ready to celebrate the beauty of Christmas, the wonder of God coming close to us, and still walking with us 2000 years later. However you have come this morning, with joy or sadness, surrounded by loved ones or on your own, we welcome you too, and pray that you would know the love and welcome of God for you. It’s been a momentous year with the prospect of enormous changes taking place in our national life. So this Christmas we might feel rather unsettled and wondering what the next twelve months will bring. But in a sense our world draws closer to the uncertain world that Jesus Christ himself was born into two thousand years ago. There are many gathered in the Chapel here, from staff to residents, ready to worship together with the wonderful St Martin’s Voices from St Martin in the Fields just over the river from here. Our resident community of young people, from all over the world, will be taking part and sharing their thoughts on Christmas, and the service will be led by Isabelle Hamley, who works with me as Chaplain. We now join together to sing our opening carol ‘Joy to the World’. Grace, mercy and peace, from God our Father and our Saviour Jesus Christ be always with you. This morning, we light all the candles on the Christmas wreath, the four candles of Advent, and the central candle, to symbolise the light that has come in the darkness in the person of Jesus. and those who live in darkness are seeing a great light. and to share the good news of your love. the light who has come into the world. Here at Lambeth palace, for the past four years, we have had a community of young people gathered from all over the world. They are from many different churches, many different countries, and spend a year together praying, studying, helping in charities and simply learning to be together. They are going to share a little of bit of their experiences with you now. When I was growing up, Christmas was by far the most exciting time of the year; but it was also important as a time of closeness to family, something I could reflect on more and more as the years went by. This year, for the first time in my life, I give up my normal family Christmas and I spend it in the company of a different family: my brothers and sisters in the Community of St Anselm. I cannot say that this is a straightforward adjustment: the absence of familiar faces and traditions of course weighs on my heart. But I want instead to emphasise what is beautiful and holy about this new experience of Christmas. As a community, we model ourselves in prayer, service and unity on Christ; we seek an openness and a vulnerability in our relations with one another, so that we may grow in humility and integrity. And in turn I find myself drawn even more deeply into the heart of the Christmas story, as we share not only in the joy of the Nativity but also in the humility and vulnerability of the Christ child, rather movingly conveyed by the carol ‘Once in Royal David’s City’. Today we are especially reminded of the sacrifices we have all made in choosing this life; yet we also have this day as a powerful sign of our commitment to Christ and to each other. So I celebrate this feast with great happiness: not only rejoicing in the company of my brothers and sisters of the Community, whom I love very much, but sharing profoundly in the mystery of the Incarnation that binds us all, community, family, friends and others, in the steadfast love of God. Good morning! I’m Jessica from Pakistan. For the last three months I am living with the most amazing people from around the world. It has been a life changing experience for me. I had always been moved by the idea of being one body in Christ, but to be honest, I have never actually experienced that sense of unity. Had never encountered this kind of communal love. Last night I was talking with my roommate McKenna from America about arriving in community. How within two days we turned from strangers into family. From eating and washing up together to praying and playing, it has all become an important part of our lives, even if we don’t always like it! Not just because it is part of our daily schedule but because of a growing sense of walking together in life and faith. Trust me, at times, it is not always as nice as it sounds. We do get tired of seeing each other but we have learnt to choose one another in love. Wherever it leads and whatever it costs. This, I think is the true essence of community. Last year, my church in Pakistan was attacked just a week before Christmas. Those voices of lament and mourning still echo in my head. Christmas, to me, as much as it brings joy and peace, also brings back dreadful memories. My family still live in fear of being attacked as they seek to celebrate the birth of Jesus. Staying away from home this year, especially this year, has been hard for me. But I have realised that I am now part of a family which shares my sorrows and burdens, which holds my hands in times of pain. I do miss everyone back home, but I know I belong to these people God has chosen for me, and that even in my sorrow I am not alone. I pray that Christ’s light may shine in all places of darkness, may His joy be strength in places of weakness and may his love and peace fill the earth. This year, we may be celebrating Christmas away from our family and friends, but we are still at home, with our brothers and sisters. Our readings today are taken from ‘Follow the star’, the Church of England’s celebration of Christmas for this year. It is an invitation to reflect on Christmas as we move towards Epiphany. There are reflections and prayers for every day, material for family, in print or online – you can find out more on the Church of England website. In a few moments time we hear from Archbishop Justin but first, St Martin’s Voices who join us today are going to sing a new arrangement made for ‘Follow that Star’ of ‘O little town of Bethlehem’ by Will Todd. There are moments in history where events stop being something that only affect some people – and start being something that affects everyone. The events surrounding the birth of Jesus were one of those moments. Jesus was born in the middle of historic events, political turbulence and great uncertainty. The census, ordered by the Emperor Augustus, was something that reached every corner of the province. Whoever you were, wherever you lived, you were caught up in it. From the beginning of his life, Jesus knew insecurity and social disorder. They were the very circumstance God chose to join us in. But if you look a little closer, you see something else about the nature of how God comes to us. As the census decree was spreading across villages and towns of the whole Roman Empire– sweeping people in their hundreds of thousands – God picked out just two. In Israel. One young woman and her husband. Two people who would have merited no special mention in the census. Two people who were, from the view of the powers of the day, simply another two numbers on the list. And two people who – to be fair – already had enough to worry about without having to find a place to give birth. But that was God’s extraordinary and unique, revolutionary choice. What does this tell us? It tells us that God is so often at work in invisible places. In the lives of people far from the headlines. And in the parts of our own lives that we might think are invisible – either because we want it that way, or because we feel unworthy, or because we’ve decided they are off limits to God. It tells us that God is not waiting for us to have the time or the space for him – he just comes! He is there if we are ready to see him or not. At times he knocks on the door. At times he makes himself known. At others he simply waits for us to open our eyes and recognise him. The shepherds were invited to the birth of Jesus. It’s one of those unlikely, subversive, upside-down details that you find throughout the story of the God who came to live among us. Because let’s be clear: these are not the people you invite to a birth – any birth, let alone the birth of the saviour of the world. In a nice clean maternity ward, would you want someone who is muddy, dishevelled and stinking of sheep? Someone known for violence and disruptive behaviour? Wouldn’t you send them away and tell them to come back when they’ve cleaned themselves up – and had a good squirt of disinfectant? Wouldn’t you call security? But this wasn’t an administrative error. The shepherds weren’t invited by mistake. God knew exactly what he was doing. Because Christmas is about everybody being invited to experience the love God has for us in Jesus – even the most unlikely people. So, if we have the capacity to invite others to share in our Christmas, we can imitate God’s generosity. And where we have been invited, maybe it’s our responsibility to accept, even if we don’t feel suitable. This is what gives Christmas its boundless depth. Its endless possibilities. And its constant challenge to us all. Because it is God who gathers people around the table. God who levels the playing field and says: you are all welcome. You are all special guests. There is no top table for the important people. The table is one table – where there is room for everyone, and we are continually called both to accept the places we have been offered, and to beckon those who have yet to sit down to come and take their place. In the reading we’ve just heard, there is a very important word: tabernacle. It means tent. God became flesh and pitched his tent among us. He doesn’t come and build a palace for himself. He doesn’t even opt for the comfort of an ordinary house. Picture the thin fabric, providing only the most basic protection against the elements. The cold wind whipping in through the gaps. The temporariness of this dwelling – which could be torn down, trampled over, moved on by those who deem it an inconvenience, at any moment. I wonder what the image of a tent brings to mind for you today. For me it’s wet and uncomfortable holidays. I like comfort. But then I remember the millions of refugees who are enduring yet another winter under fabric, rather than the bricks and mortar of the homes they have been forced to flee. Or the rough sleeper, ignored or ill-treated by almost every passer-by, as if they have simply ceased to exist as unique human beings. On the one hand this is the greatest mystery there is – that the God who is all powerful would choose to put himself in a place of such vulnerability. That God came where he wasn’t wanted. He came to live a life on the edge. A life on the margins. On the other hand – the message could not be clearer. If we look around today and wonder where God is, it’s not just in the safe, solid places of the world which are familiar. We see those God identified with in the faces of those who live in tents. Those who are homeless. Those who are on the margins. Those who are disregarded. Because there we see God – and there we are called to be his partners in being the bearers of his love, his care, his hope, his justice, his healing, and his making things new. Our prayers are led by members of the community here at Lambeth Palace. ﬁll you with joy and peace.